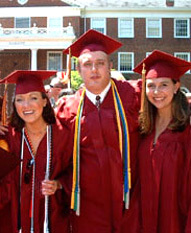 Our alumni group could be divided by the three time segments that reflect the dynamic evolutionary progression of Communications at Elon: School of Communications graduates since 2001, Department of Journalism and Communications graduates from 1988-2000, and English Department graduates with a journalism emphasis from 1987 or earlier. If you are an alum, please drop us a note at communications@elon.edu, telling us where you are and what you're doing. Our professors enjoy hearing from former students, and we share alumni news with one another. The importance of our Communications Advisory Board cannot be emphasized enough. Every semester, 20 or so media professionals come to Elon for two days to speak in classes, talk with seniors about the job market and give faculty and administrators insights into making the School of Communications even better. When it comes time for Elon students to graduate, they find a network of alumni and friends ready to help them begin the process of embarking on a fulfilling career. As we go about our business from year to year, administrators and staff at the School depend upon alumni, board members and guest professionals to continually build our knowledge base and enlighten our students. Please use the navigation links at the right to learn more.